A combined level and correlation meter for Surround signals for the 5.1 - Standard The levels of all six channels as well as the phase correlation between all combinations of two channels are represented, so that defined statements are possible for the mono compatibility of a stereo and a Surround signal, in addition, for the Stereo compatibility of a Dolby Prologic signal or a 5.1-Signals in the Downmix. The commonly applied DIN45406 with a head room of 6 dB referred to digital 0, Nordic N9, BBC PPM, EBU PPM and the K-System (K-20, K-14, K-12) by Bob Katz are easily and individually recallable by using the Windows-function keys F1 to F 8. 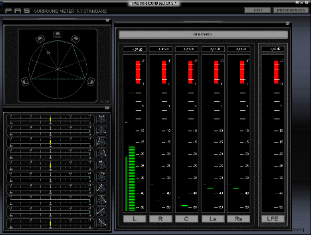 As a complex surround mix demands the full attention and concentration of the sound engineer, the accompanying surround display has to show the sound engineer at one glance the sound in its total complexity. This is the reason why the design of this display was kept factual and clear. At the left side above the surround meter, a circular arrangement of the five sound sources (speakers) can be found. This arrangement does not comply with the arrangement of the famous (and dreaded) ITU-circle, but it shows in a mathematically exact manner the present mixing ratio of the five sources to each other by means of the surround ball moving in the circle area. Especially the often very critical balance between the front and rear speakers is shown clearly and immediately here. However, this only refers to the loudness of the five channels to each other and not to their phase relation. The phase relation of a chosen pair of channels will be shown on a correlation display below. The correlation display demonstrates the so-called correlation level. For a better understanding, we will now make a short excursion into the physiology of human hearing. To locate the instruments of the stereo panorama, the ear does not only assess the difference of sound level between the two channels of a stereo-recording; the even more realistic impressions originate from differences in the duration. When taking a closer look of the hearing process in the nature, the reason becomes obvious: To reach the ear which is turned away from the sound's point of origin, the sound wave has to cover a longer distance, hence arriving there later. From a technical point of view, this delay is perceptible as a phase shift between the channels. If this phase shift is too big, the signals are being deleted during a mono-reproduction process as positive and negative half-waves of the vibrations compensate each other and the mono sum becomes null. The dramatic thing is that these deletes are different for every instrument; hence the whole mix is shifted. So if you listen to a mix in mono which sounds well in stereo, some instruments are suddenly too low or the reverberation is missing. With the High OL POINT and Low OL POINT adjust it two borders, between which you can assign different colors to the bar line display. The color Base Color. applies to the segments of the bar line display below the Low OL POINT, the color Low OL Color. to the range between the two adjusted points, and the color High OL Color. to the range above the High OL POINT. Thus the appearance of the announcement can be changed variously and be adapted to your used representation. After having started the programme, you should first of all relocate the audio channels of your sound card in the available channel routing. Therefore you can either use the internal Windows-MME audio driver or installed ASIO-drivers if they are activated. The PAS Surround Meter has the ability to approach all known audio drivers; the sampling frequency (48Khz,44Khz ) or the applied Bit resolution is not of importance here. In the case that a Bit/splitting with 88.2 Khz or 96 Khz is used via an ADAT-Interface, however, the configuration has to be carried out via two separate Opto-ADAT inputs. A double seizure of the surround inputs with similar input channels will cause an error message!! In this case you have to restart the PAS Sourround Meter and feed the audio channels correctly. Of course it is also possible to use the surround meter as a usual stereo display. Here the user can chose between 2 different types of display diagrams. The bar diagram always refers to null. We are aware that the real correlation does not have a relation to null, but this diagram helps to keep a better overview. Of course this is a matter of taste. This is why we also put the lines display as default. The 5.1-Format offers completely independent channels, with which therefore also the rear loudspeakers can be separately from each other headed for and which entire frequency range to take off. This extended possibilities open clearly with placing the instruments in the area, and klangliche changes by Matrizierung cannot even develop. Also with the center channel it concerns an individual channel, with whose separate control beyond the possibilities of a LCR Panpots however it should be considered that the phantom center between left and right channel nevertheless further existed and with same signal portions in the center channel can cause extinctions. On the other hand a situation can be created by skillful placing of some events in the center channel and other one in the phantom center, with which the center signals before a formed texture seem to stand for through left and right channel, which seems to move on change of the hearing position even opposite the center channel. The name 5,1 states that beside the five Fullrange loudspeakers an additional Subwoofer is used, which is likewise headed for by a discrete channel. This as LFE (Low frequency Effects) did not designate channel serves however for the recording the satellite loudspeakers of completing bass signal. That would be already not meaningful, because with music production does not admit the specific data of the respective hearing plant are. Thus if the frequency response of the five main loudspeakers is not enough far enough down there and if these are to be supported therefore also by the Subwoofer, then this is to be realized rendition-laterally, as it already admits for example from Stereo Subwoofer plants is. The LFE channel serves excluding the recording of low-frequent effects additionally for the Fullrange range of the main loudspeakers. Here extremely deep basses with high levels and therefore large diaphragm deflections are well waived, which do not load the main loudspeakers any longer. When mixing in the 5.1-Format clay/tone engineer does not enjoy nevertheless all liberties of the completely discrete channels, because many consumers do not operate their Surround Abspielgeraete at all in the Surround mode. Here an automatic Downmix then often takes place in the playback unit. This leads on the one hand to the fact that with the Platzieren for example thundering a thunderstorm exclusively in the LFE channel dead silence will prevail completely surely with the users, who did not attach Subwoofer, why one avoids such extreme attitudes with production and always also on the main loudspeakers should put supplementing signal portions. On the other hand however the rules there always apply for the attention of the phase positions with the pro log IC or Stereo format in the long run also to a 5.1-Mischung, with a later to count automatic Downmix are. But the phase relationships between all pairs of channels must be correct, and appropriate correlation announcements, how them offer the PAS Surround meter, are very helpful. By the discrete center channel, significant signal portions effects in the LFE channel, important from the rear loudspeakers and, the speech cannot be when exclusive hearing the left and right channel of Stereokompatibilitaet. Therefore its own mixture is to be made for Stereo listeners, which does not have to be noted however obligatorily on two further channels of the Surround Tontraegers. The format Dolby digital contains meta data so mentioned, in which the controlling of the automatic Downmixes can be given in the playback unit by producing clay/tone engineer. Since this has also effects on the sum levels, the PAS Surround meter refers such measurements into its concept also.